I have dreamed about this cake for months. I researched and researched - I was going to donate it to a charity auction and the night before I was going to make it, I came down with strep throat. No joke. The doctor specifically forbade me from making food for people. Which I guess makes sense but COME ON. Luckily, it's the holiday season and a holiday party presented itself the next week. This is a rich and dense cake. It is intense. It is fantastic. The possibly best part of this cake was that when I made it, my friends had made a bunch of other cakes (we like to bake!) and so there was a lot left over. I cut it up into little "bites." Then I took those to a baby shower the next day and they were a hit! Start with the cake. This is a double layer cake so grease/no-cal butterspray two 9 inch cake pans and preheat the oven to 350 degrees F. Mix the flour, sugar, butter, cocoa, water, baking soda, salt, vanilla, baking powder and eggs. Mix well. Separate equally into two pans and bake for 35 minutes until toothpick comes out clean. Leave to cool for a few minutes. For the chocolate frosting, mix the butter, confectioner's sugar, cocoa, vanilla and milk. It will be smooth and rich and easy. Just mix. EASY. For the salted caramel frosting, bring the sugar and water to a boil on the stove. Let cook until amber in color for about 5 minutes. 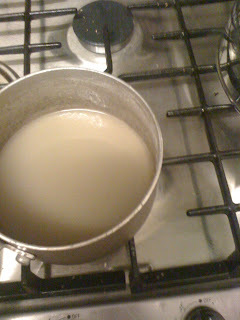 Remove from heat and add cream and vanilla. 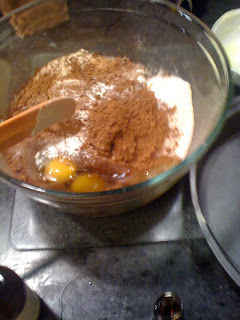 Mix and leave to cool. Mix the butter and salt in a bowl with powdered sugar. After the caramel has cooled (about 20 minutes), mix into the frosting. 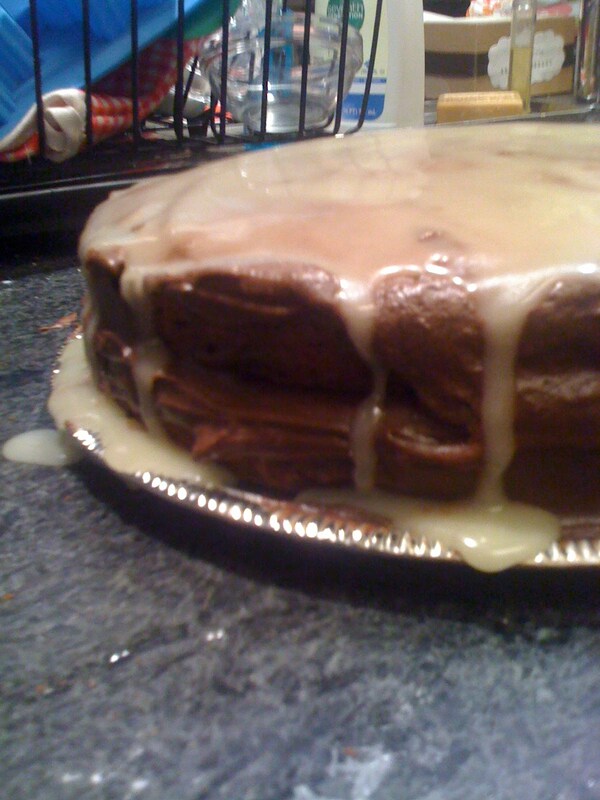 To assemble, use the chocolate frosting as the glue to hold the two cakes together. 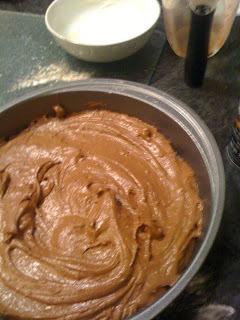 Spread a thin, even layer of frosting between the two cakes and then around the sides of the cake. Pour salted caramel frosting over the top. It will be perfect and delicious. Enjoy~!